Puglia is amazing, really unique and something special, just got to love Puglia. It’s one of the most southern Italian provinces that can offer you a one of a kind experience. The little white houses in the Valle d’Itria are called Trulli and keep you nice and cool when it’s hot outside. Then you will be surrounded by century old green olive trees and colourful red soil. And the blue sea is always nearby. The food is simple and has a rustic feel about it but it is beyond delicious. But what makes Puglia even more amazing are the people and that is a reason why I love Puglia. In this case the people of Ceglie Messapica in specific. They have been so friendly and helpful! Shortly after we set foot in Italy we did a wonderful engagement shoot with Dutch couple Rick and Sheena, shot by Raisa Zwart Photography. Organised and styled by Wedding Guru, so I was quite happy with the outcome already! Because the couple was so sweet and looked so adorable. Sheena looked like a model in her blush dress and they felt so at ease with Raisa as their photographer. Even when we were at a piazza where it was quite crowded they still felt comfortable with all the attention. Ostuni is a beautiful white city and one of the many reasons why many visitors love Puglia. We drove back to Ceglie Messapica and all of a sudden I realised I had left my telephone in the charger in our accomodation and didn’t bring it with me, since it was empty anyway. This meant that I had left the adress or better said location there as well. Raisa and myself got lost and the road was hard to recognize in the dark. We got stranded somewhere in the center of Ceglie Messapica and we had absolutely no clue where to go to. So we decided we should stop and ask someone to point us to our trullo. We parked the car somewhere and entered restaurant La Locanda, actually later on we realised we walked straight into the kitchen of a restaurant, to ask if the people there could help us out. The family that runs the restaurant is extremely nice and helpful. Everyone tried to help, they started to call an uncle, mama came and papa came. And the son Dominik was still baking the pizzas in the typical Italian pizza oven, trying to help us with our search on Google maps at the same time. Meanwhile we decided to order a pizza and you can only imagine how delicious and tasty a real authentic Italian pizza is when you are getting hungry and slightly cranky and tired. 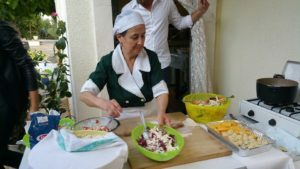 The food is also a reason why I love Puglia. Then Dominik decided to leave the pizza baking to his dad, just to help us out. Very patiently he drove in front of us with his own car trying for us to figure out if we would recognize the house we were staying in. It took us quite a while and some driving but all of a sudden we were in front of our accomodation. At first we still didn’t recognize it and were absolutely sure we would never get into a nice and warm bed and would be exhausted for the next wedding day. But luckily it definitely was our trullo. How grateful can you feel when a total stranger turns into a blessing in disguise. It was so kind to help us out in this unsolicited adventure. 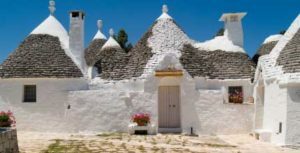 Our trullo could never have felt more cozy!